Swim School - Bluewater Scuba - "Where Nashville Learns To Dive"
Miss Anna’s Swim School is excited to offer swim lessons again in 2015! 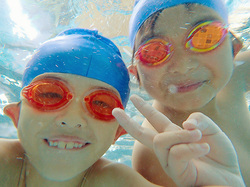 We provide a comprehensive three-week swim program for your child, beginning at age two or three. Classes meet daily, Monday through Friday, for 30 minutes and include a maximum 5:1 student/teacher ratio. Additionally, an assistant instructor remains in the pool to further ensure that maximum safety and training standards are maintained.